In 1948 the Nationalist Party (NP) won the election, and began to introduce the policy of apartheid. 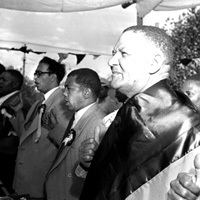 The African National Congress (ANC) reacted immediately to the government’s increased introduction of racist and repressive laws, and in 1949 adopted the Programme of Action. This prompted open defiance against the government, and action against pass and other restrictive laws. On 26 March 1950, the ANC held a ‘Defend Free Speech’ convention in reaction to the Suppression of Communism Act passed by the government. Dr James Moroka gave his first public address. The ANC called for a May Day stay-at-home in demand of the vote. The strike was successful with more than half the black Johannesburg workforce adhering to the call. The day however, ended tragically when police started shooting, killing 19 and injuring 30. The ANC declared 26 June as a national day of mourning, to be observed annually as Freedom Day. In 1952 the ANC launched the Defiance Campaign, which gained support across South Africa from blacks, Indians, a few coloureds and whites. People were called on to break unjust apartheid laws and offer themselves up for arrest. The idea behind the campaign was that jails would become too full and the police service would be thrown into chaos. Many were arrested for using ‘white’ amenities, not carrying passes and other related transgressions. The African National Congress Womens League (ANCWL) was very much involved in the campaign. In December 1952 Albert Luthuli became president of the ANC, and was banned by the government in early 1953 under the Suppression of Communism Act. In 1955 the ANC started a boycott of Bantu Education and called for an alternative system. The campaign was never a huge success. No viable alternative education was proposed. With the Defiance Campaign dying out, the ANC, Indian National Congress, Coloured People’s Organisation and Congress of Democrats (COD), collectively referred to as the Congress Alliance, decided to plan a convention and draft a new constitution for South Africa. On 26 June 1955, a meeting was held in Kliptown in Johannesburg with over 3000 delegates from across the country. People had gathered to put together the Freedom Charter, and had already submitted their ideas. Clauses were accepted according to public support. Police watched over the events of the day, searched people on arrival and departure and conducted interrogations. Police raids increased after the meeting, and by the end of the year 42 ANC leaders had been banned. This caused many problems for the ANC. Police and government action reached a climax in December 1956, when the government declared it had uncovered a dangerous conspiracy. They arrested 156 members of the ANC and other political movements, and accused them of high treason. The preliminary hearing of the Treason Trial was held in January 1957, with the accused in cages and the prosecution prepared with items collected in previous raids. The prosecution spoke of a conspiracy to overthrow the government and replace it with a communist republic. The Freedom Charter was seen as part of the conspiracy, and was therefore a document promoting treason. The defence argued the case, saying that there was no evidence that the ANC was violent. At the end of 1957 the state released 65 of the accused, but continued the case with the remaining 91. The trial continued, with the state changing the charges when necessary and eventually dividing the accused into two groups. In 1961 the last remaining 30 were found not guilty. The Treason Trial was therefore an attempt by the government to break up the ANC, by removing leaders and causing financial and psychological pain. While the Treason Trial was taking place, other ANC campaigns continued. On 9 August 1956 about 20 000 women marched on the Union Buildings in Pretoria against the extension of the pass laws to women- a breakthrough in the organisation of women. In 1957 there was a bus boycott in Alexandra resisting fare increases, and thousands of residents walked the 20km to work until the fares were reduced again. During the year there were also protests against beer halls, wages and passes, and in 1958 protests were held to coincide with the elections.